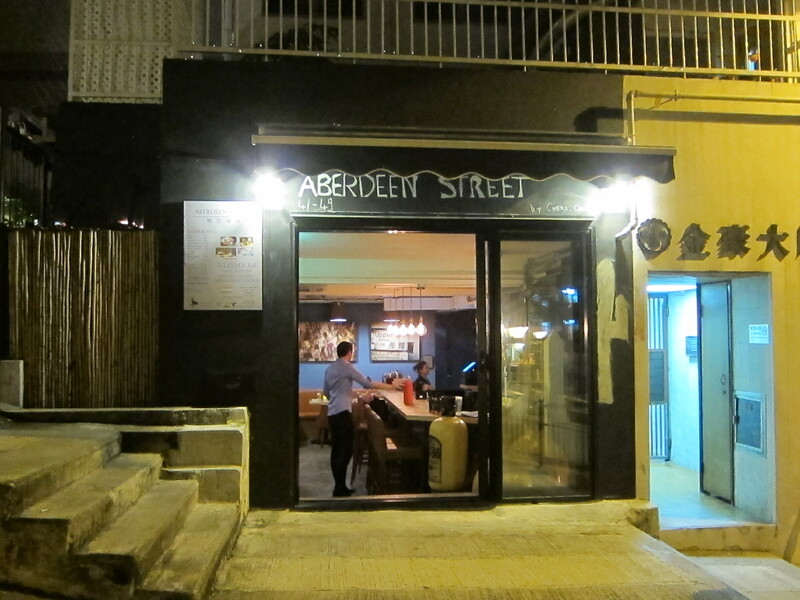 If it wasn’t for what seems to me, a mile-long hike from the depths of Quarry Bay MTR station to the outside world, I’d be milling around there more often as there are a few restaurant gems to be found in that area. The latest addition is The News Room, the newest member of the Press Room Group and an apt reflection of the commercial surroundings. 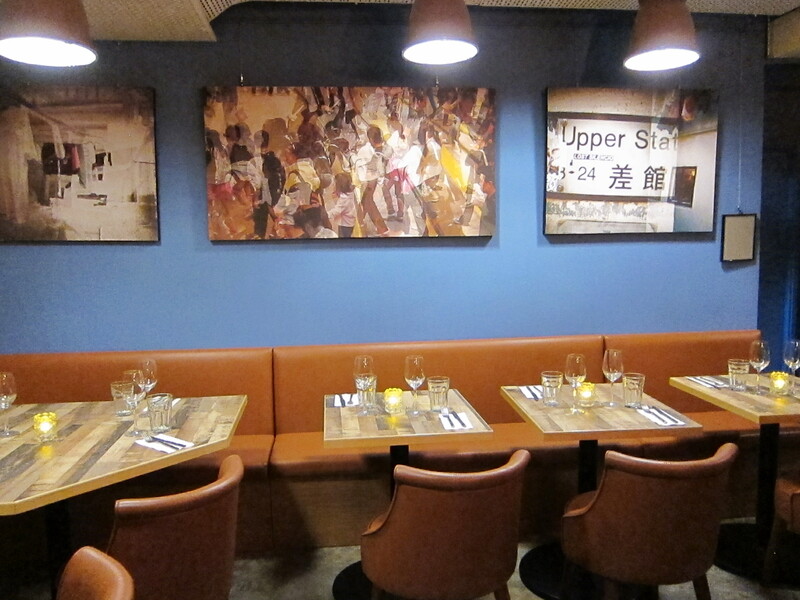 As a frequenter of The Press Room on Hollywood Road and a fan of their mac n’ cheese, I was excited to find out if there was anything different about The News Room, and as it turns out, there is. 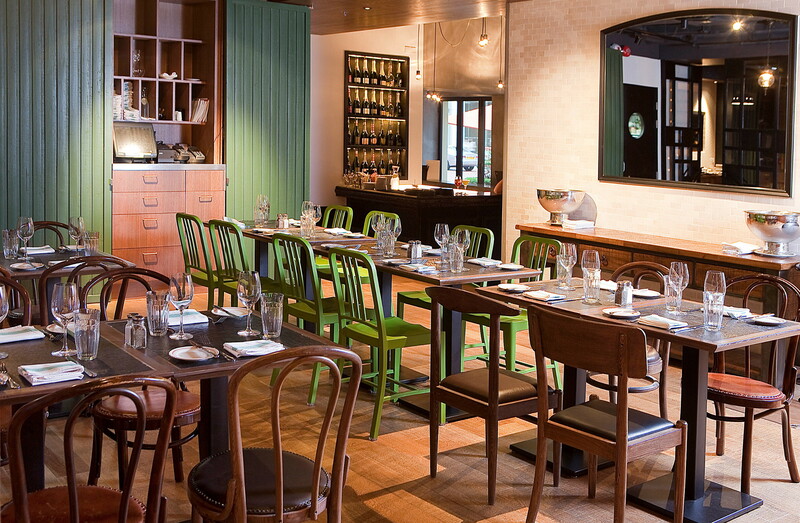 Clearly designed for the cool media and smart-looking business-types, the interior is all wood and leather seating, walls and floors, with an air of 1940s laid-back sophistication. It is quite easy to picture a budding journalist scribbling away in the corner over a glass of whiskey or two. 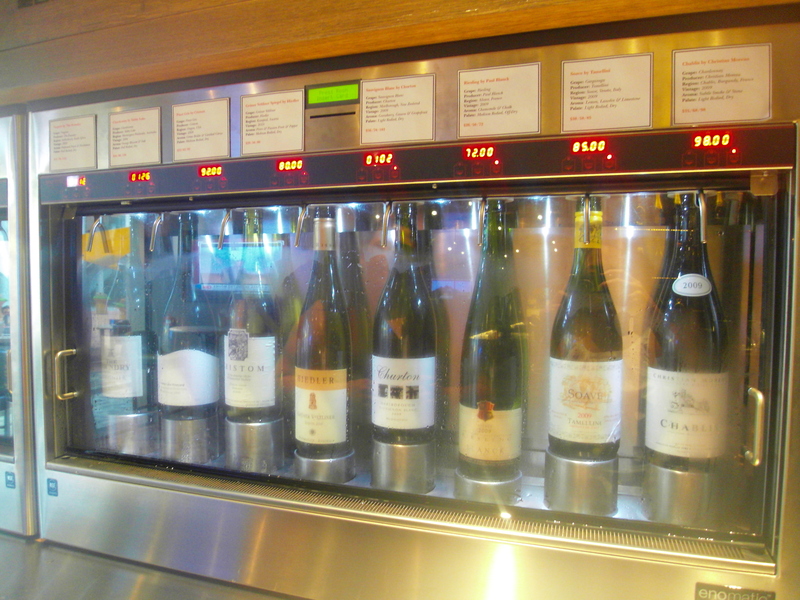 A bar flanked by a myriad of wines and liquors, greets you in the doorway and one of the first things you might notice are these brilliant Enomatic wine dispenser machines. 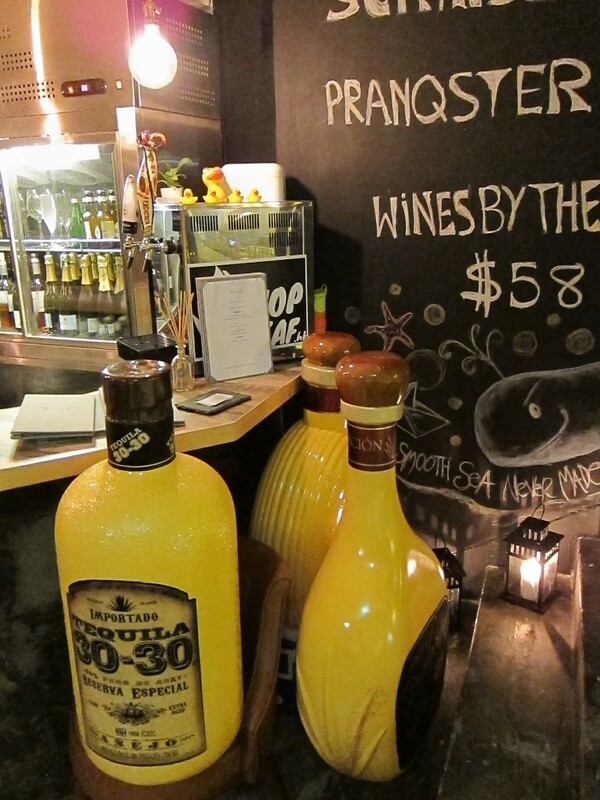 Similar to what they have at Tastings wine bar, these machines are available for trigger happy corporate, advertising and IT people at happy hour after work. The glasses come in small, medium or large, and if you’re having a particularly bad day, you can help yourself as many times as you like, using their special News Room card. I settled into one of the booths at the back and managed to have a lovely chat with Kavita Faiella, the Press Room Group’s wine director and sommelier. I’m not big on wines so it was a great opportunity to learn a thing or two from Kavita. 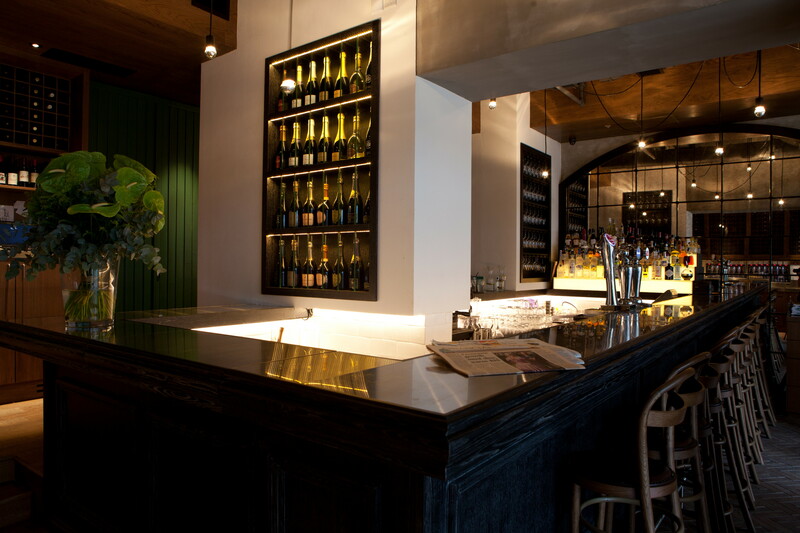 Boasting a selection of just under 200 wines, the News Room’s wine list comes in a moleskin journal notebook form on lined paper. There is a Global alphabetical list, (not by country), which has both Old world and New world wines of every kind. If, like me, you prefer cocktails, take a look at their signature cocktails which are created as a reflection of past journalists, writers and journalistic events, such as the Nixon sour and the Hemingway Daquiri. I had the Love and War cocktail to taste, which is in homage to Martha Gellhorn, one of the greatest war correspondents of the 20th century. The mixture of Pineau des Charentes, elderflower liqueur, apple juice and basil, was very refreshing and a good start to my wine studies! 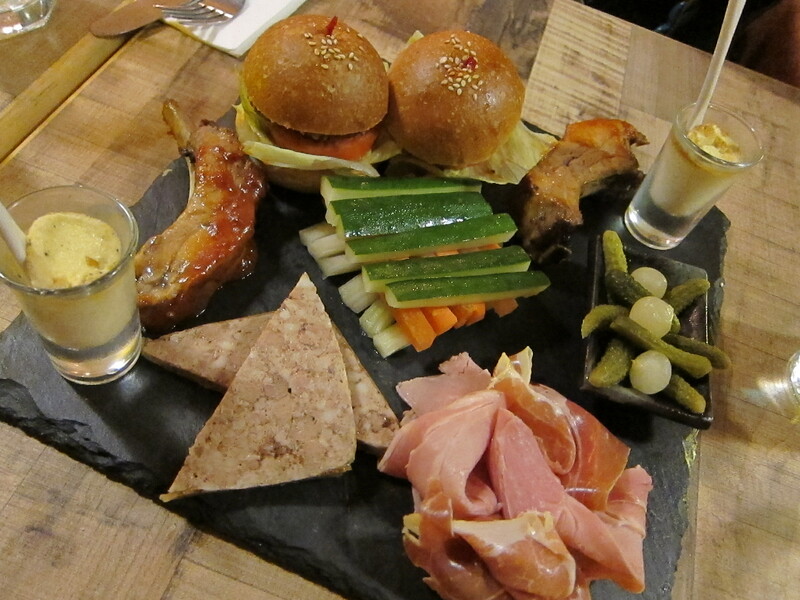 The food menu has a variety of New York style deli snacks and international comfort food, created by ‘Polish by-way of London-experienced’ Head Chef Kris Bandel, from The Press Room, who I discovered used to work at a couple of my favourite eateries in London! 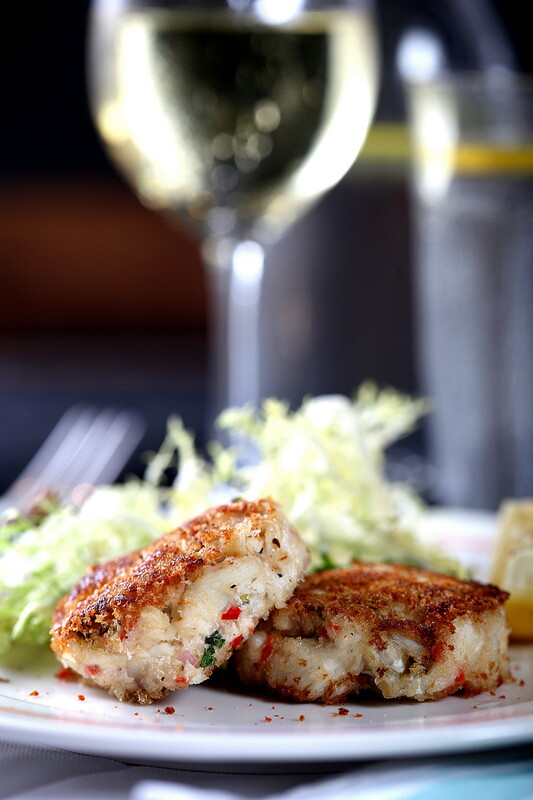 My gorgeously fresh and meaty Louisiana chilli crab cakes (a signature dish served warm with pepper, Cajun spices and lemon dressing) went extremely well with the Hiedler Grüner Veltliner white wine from Austria, which I was told, is a nice alternative to Sauvignon Blanc. 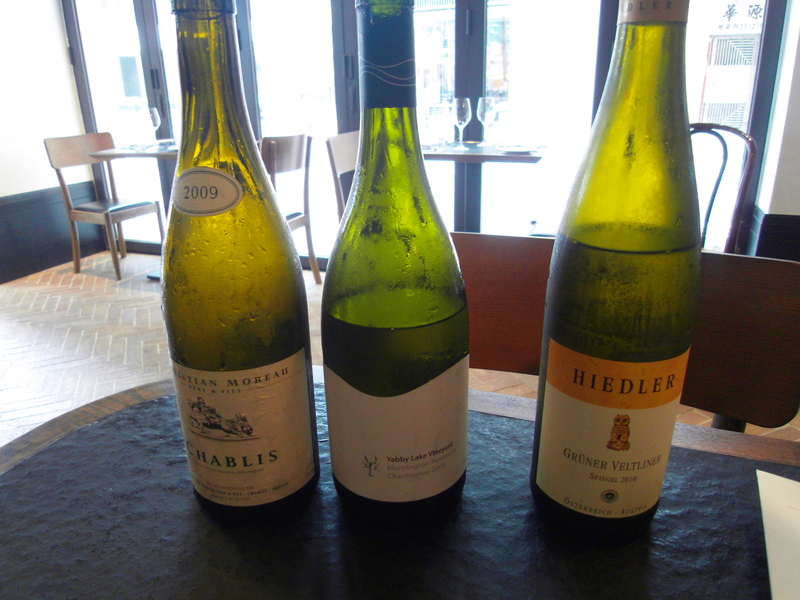 The other two white wines I sampled were the Old world Christian Moreau Chablis, made from Chardonnay and a New World wine from Australia’s Morning Peninsula- Yabby Lake, which, after several large sips, I could detect was earthier and more full-bodied. For mains, I was greedy. I had their black truffle mac & cheese and the braised oxtail and kidney pudding which I was so happy to see on the menu, that I was practically hyperventilating (I’m a massive steak and kidney pud fan). Anything with black truffle makes me feel a) posh, and b) spoilt. Mac & cheese with parmesan, mozzarella, pecorino, white truffle oil on top and black truffle shavings? Whoah. I was in truffle heaven. Plain mac & cheese makes me smile with glee anyway, but this was quite decadent, and the smell was just sublime. 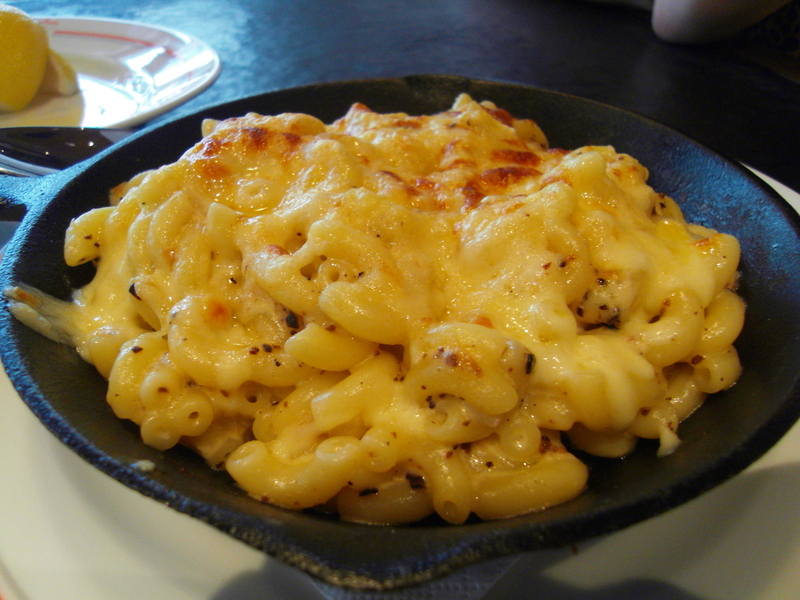 Bits of burnt cheese on top, gooey cheesy macaroni mouthfuls and sips of wine were making me giddy. 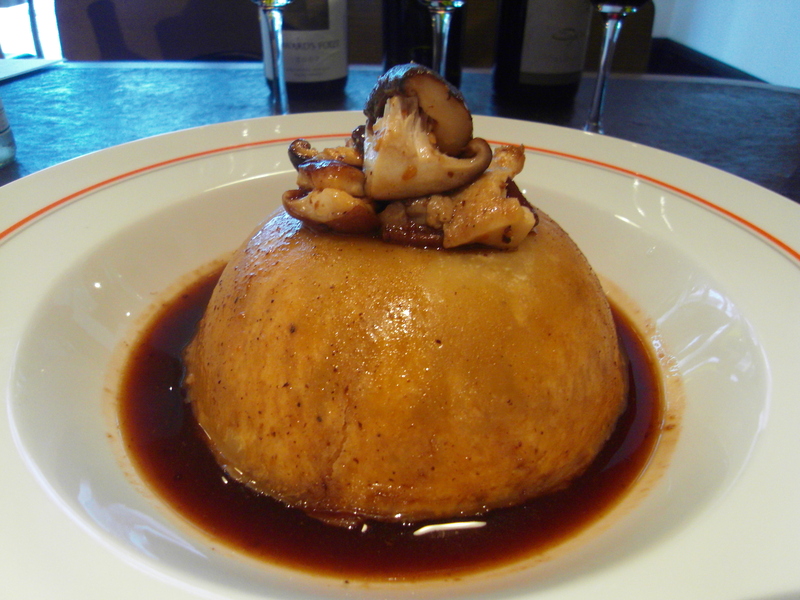 The next treat was the much anticipated oxtail and kidney pudding. I often look longingly at Fray Bentos’ tinned steak and kidney puddings in Taste, but having no oven, all I can do is pine away when I have cravings. This dish was enormous, a large suet dome sitting in a pool of gravy, hiding its meat, and what I loved was how generous Chef Bandel was with the kidneys! 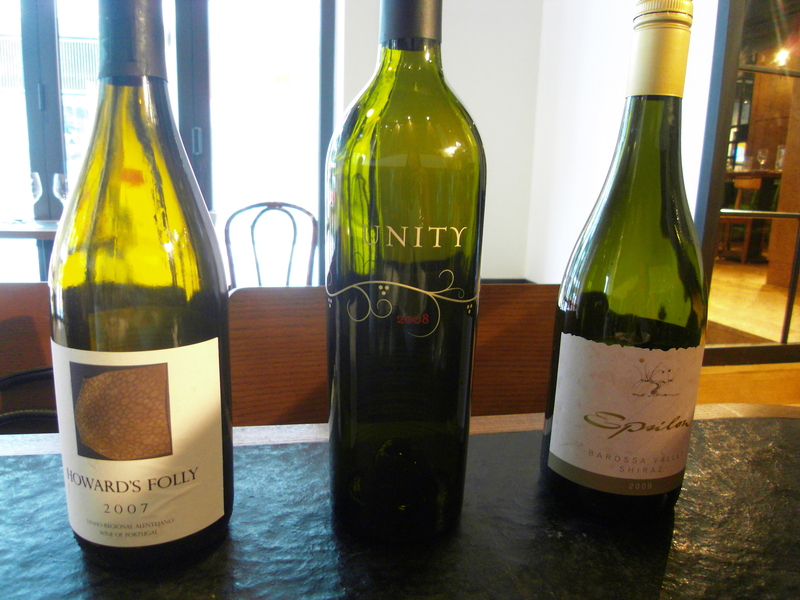 With this, I tried 3 red wines- a Portuguese wine called Howard’s Folly, a premium red- Unity from Napa Valley, and Epsilon, (a Shiraz), from Barossa valley. 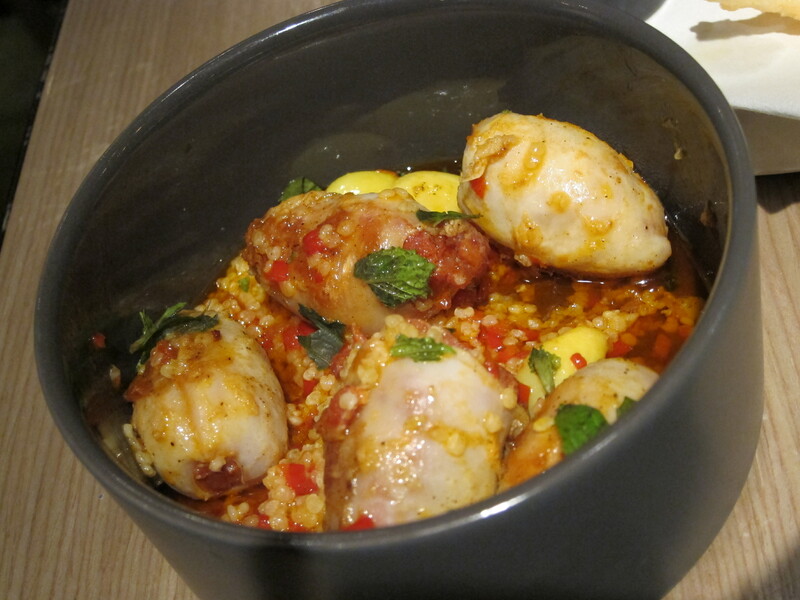 Chef told me how surprised he was at its popularity; obviously some secret pud-lovers out there in Quarry Bay, but I’m not surprised at all as the oxtail was beautifully cooked, though I could have done with less suet, but you don’t need to eat it all. 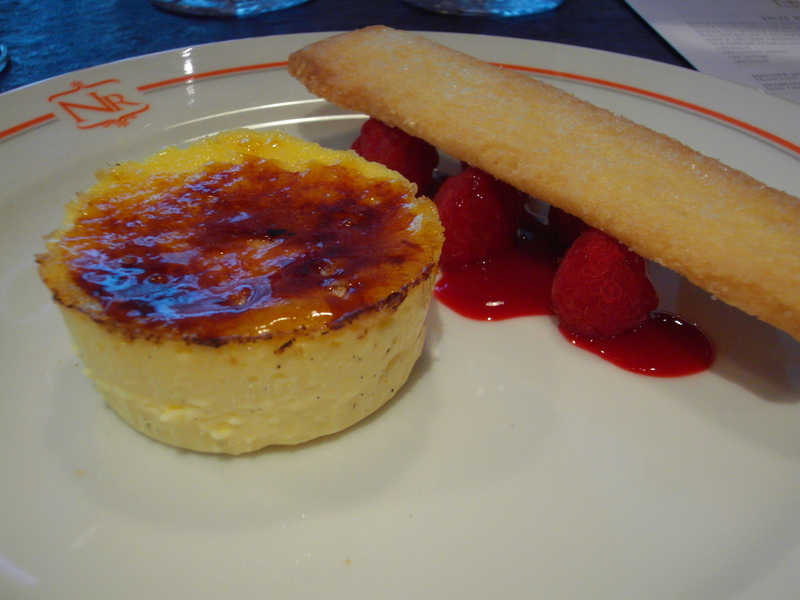 To end a very boozy, heavy lunch, I had their crème brulee, which rather quaintly, came without its ceramic pot encasing. It was creamy and delicious and polished off with a glass of dessert wine, the New Zealand Wairau River, Botrytis Riesling 2009. The ambience I felt, is suited to those with a more serious or mature predisposition, and isn’t meant to be an establishment for the achingly hip or young. 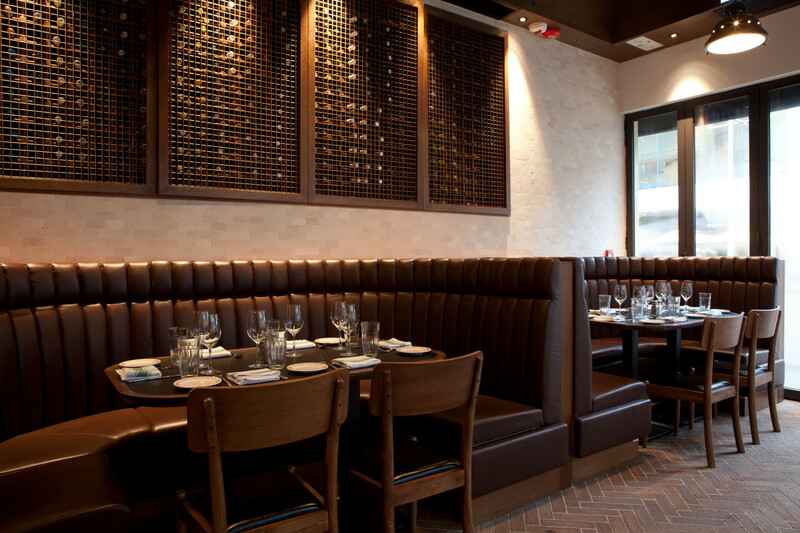 They have a private dining room for larger parties and an outdoor terrace, which is a great place to wind-down after work. 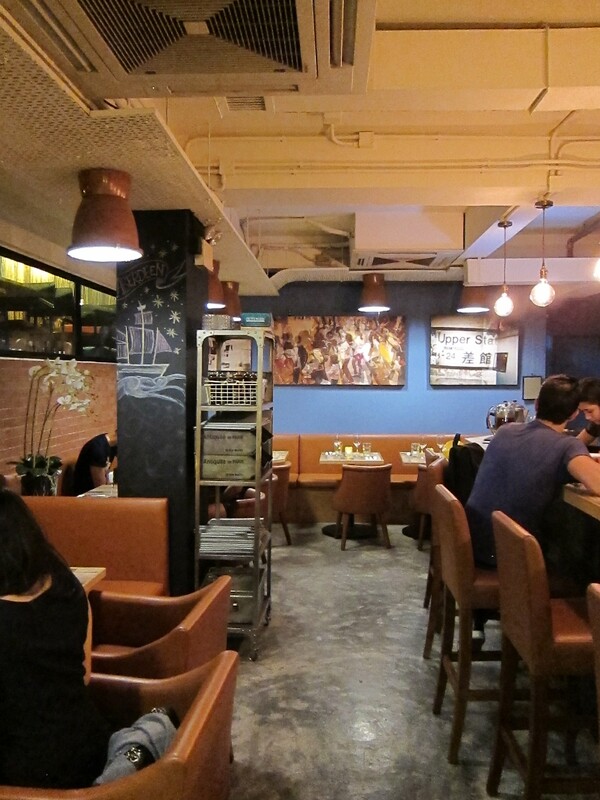 The interior is a place for intimate conversation and enjoyment of simple but high-quality food at decent prices. 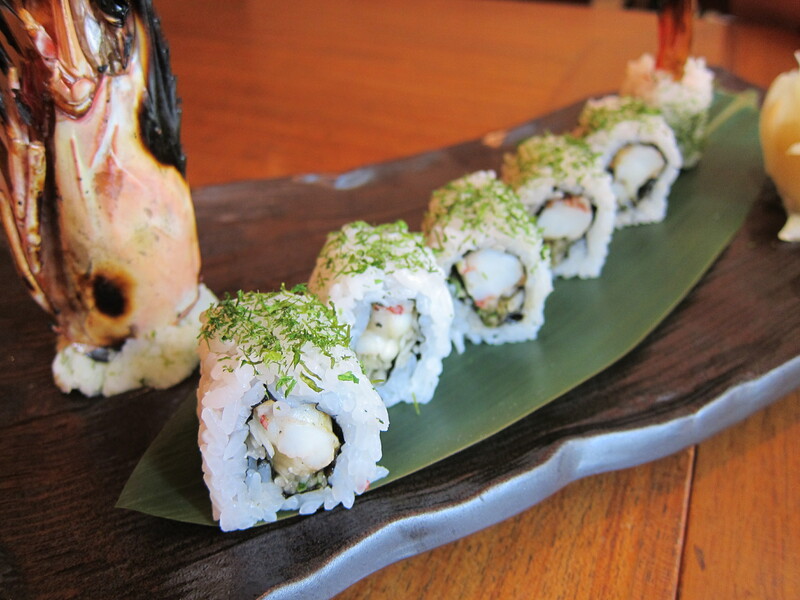 You can also read the review on Sassy HK! 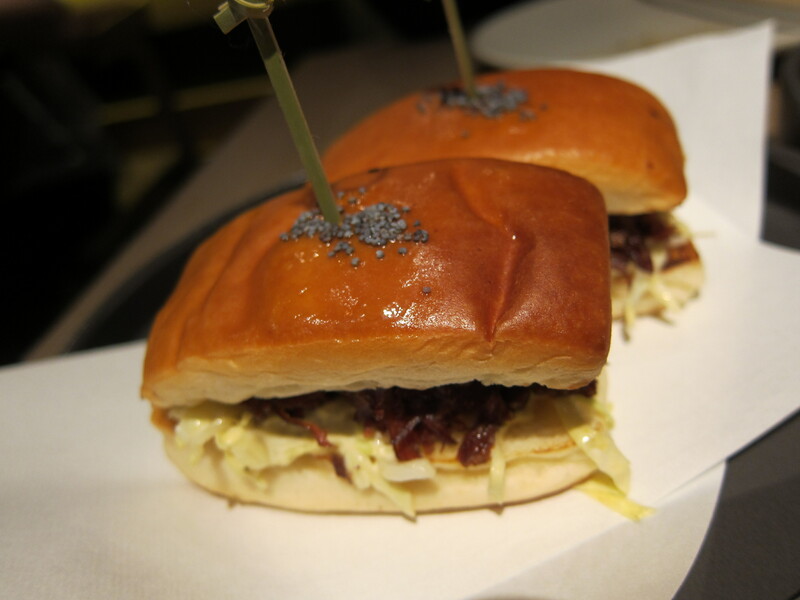 Categories: Western | Tags: black truffle, Creme Brulee, Hong Kong, mac & cheese, mac n cheese, macaroni and cheese, Quarry Bay, The News Room, The Press Room, The Press Room Group | Permalink. Dessert, pastry, chocolate. These words speak to me and many women of guilty pleasures, extra calories, the naughty but oh so good end to a meal or a sneaky sugar fix during the day. 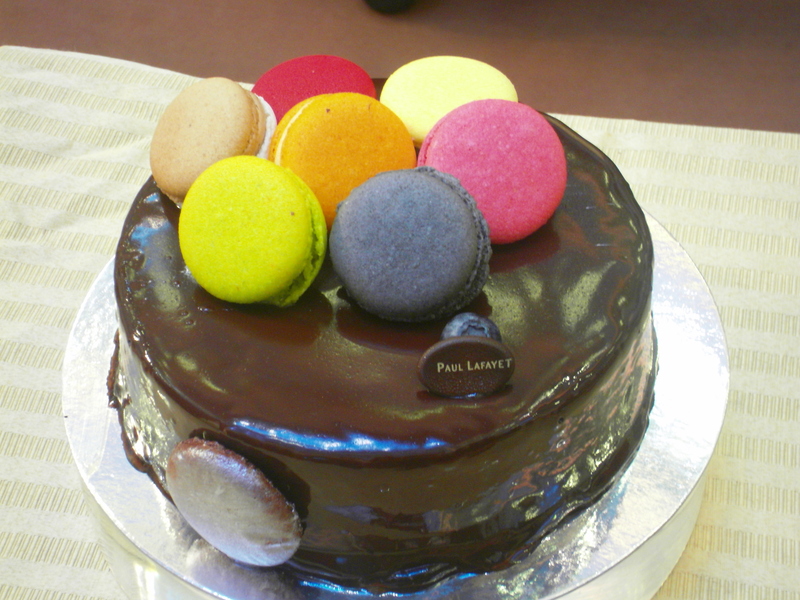 But it makes us happy, and Hong Kong females are going to be ecstatic to hear about a branch of the French patisserie Paul Lafayet, in Windsor House in Causeway Bay, which opened 6 months ago. The original branch has been in operation for over a year in Tsim Sha Tsui, but frankly having a Causeway Bay shop means we no longer have to trek over to the dark side to get our Macaron fix. Toni Younes is the French entrepreneur behind Paul Lafayet, (the name inspired by his Great-grandfather I am told), and is a world traveler and a food lover. 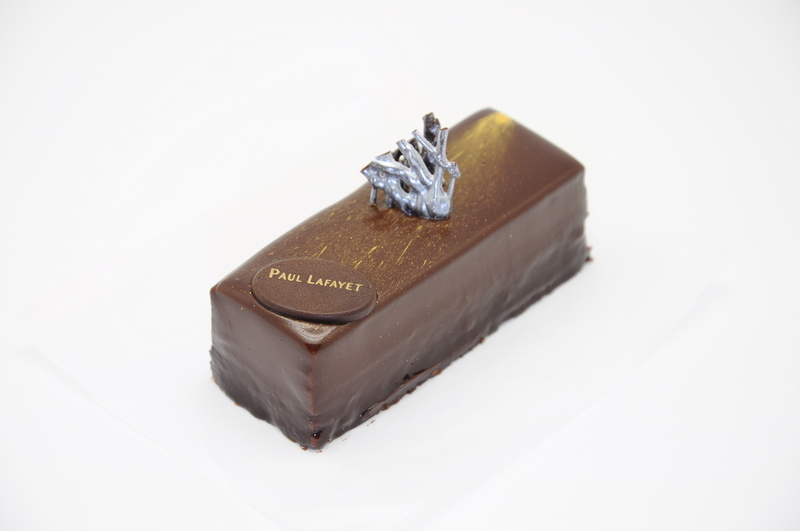 Such is his passion for French food, pastisserie in particular, that he was compelled to open Paul Lafayet in Hong Kong to share the art of artisanal French pastry. Two French chefs act as consultants – Alexandre Brusquet who worked for seven years with 3 Michelin Star chef at Paul Bocuse restaurants in Lyon, France and Pascal Schwalm who was the Intercontinental Hong Kong pastry chef for four years until the end of 2009. There is a kitchen offsite that delivers the fresh pastries twice a day to both branches. 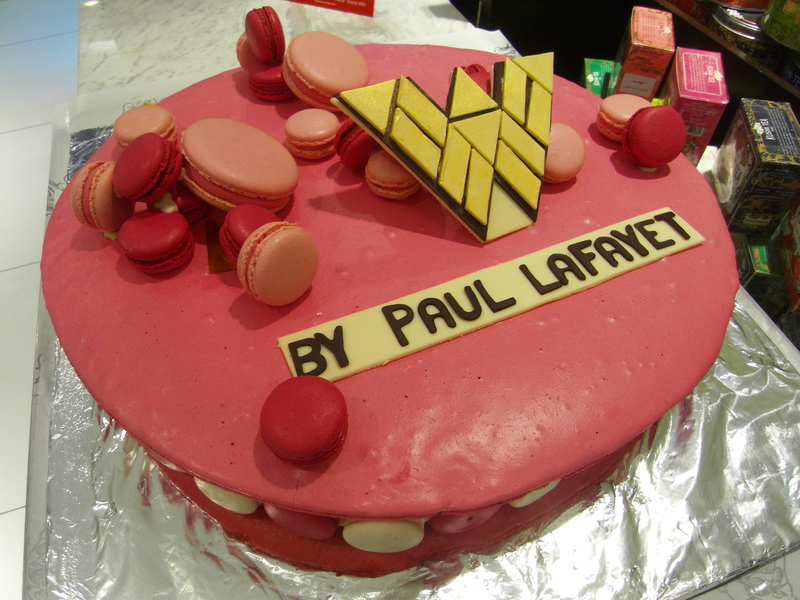 Paul Lafayet clearly targets females. Everything is just so…pretty. 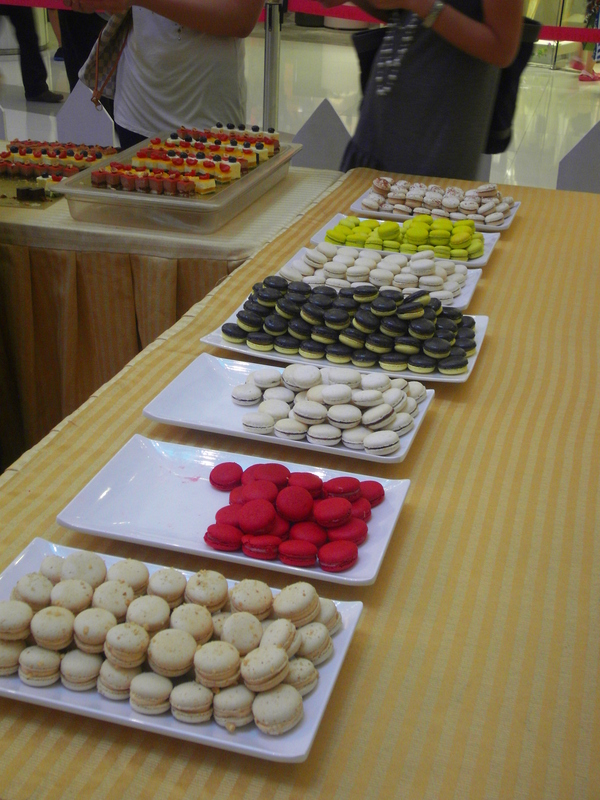 The presentation of their pastries, cakes and macarons is exquisite. 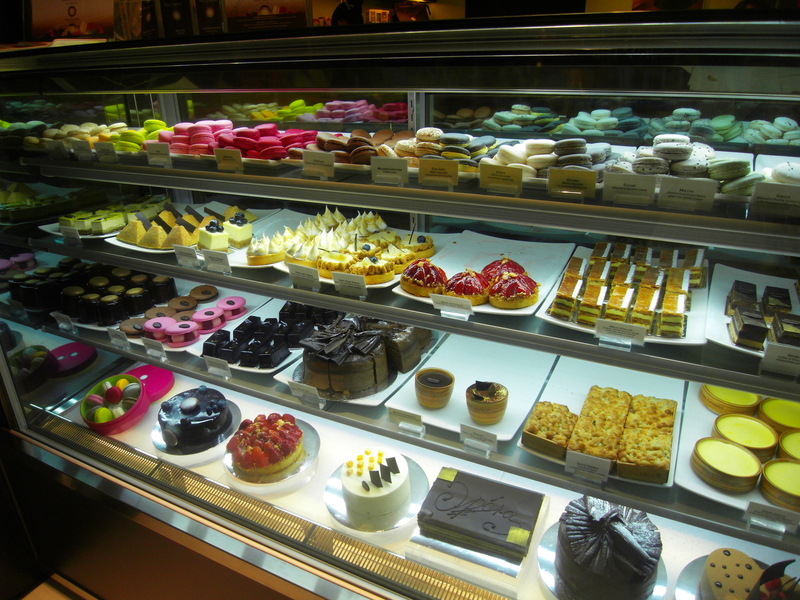 Each sweet beautifully created and nestled safely behind glass, gawked at by passing children, mothers, groups of women and the odd lone female caught unaware as she walks through the mall who then stops and looks longingly at the cakes. And drools. I myself end up taking a bazillion photos of the display cabinet; it’s like a cake gallery. It should have had a place in Art HK. 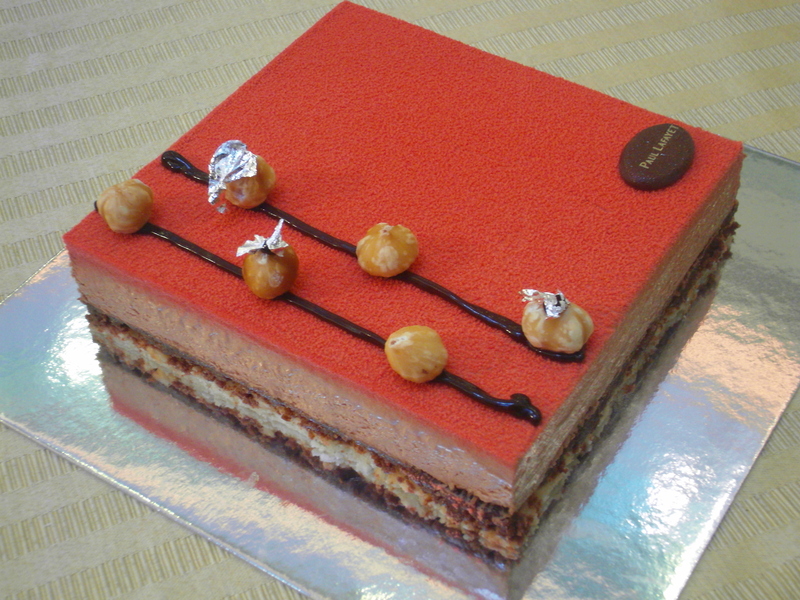 All the pastries are made from premium ingredients with no preservatives and are all Artisinal French style desserts. I don’t have a sweet tooth, more a savoury one, my first inclination is to hanker after a bacon buttie rather than chocolate, but my dinner of dessert was sublime, I almost cried when I ate my Macaron. 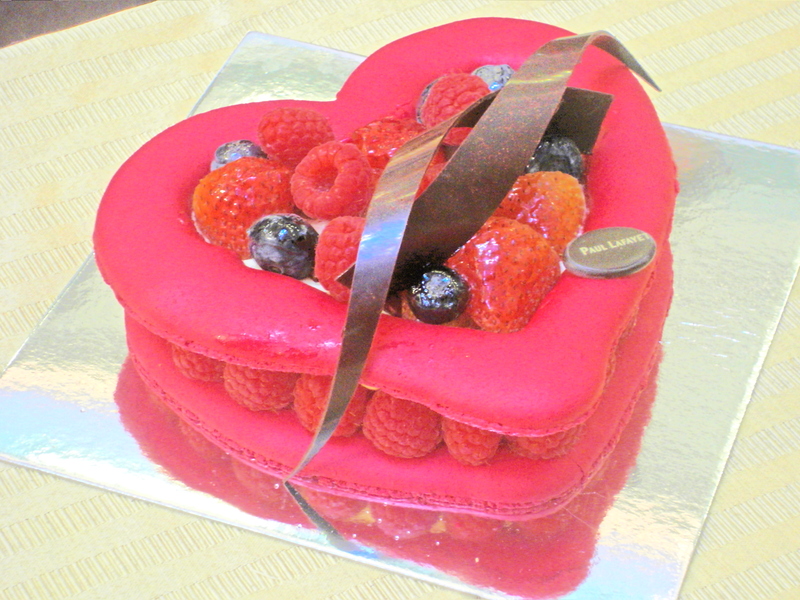 So God help those of you who love sweet things. It will be like Christmas, all birthdays and festivals have come at once. 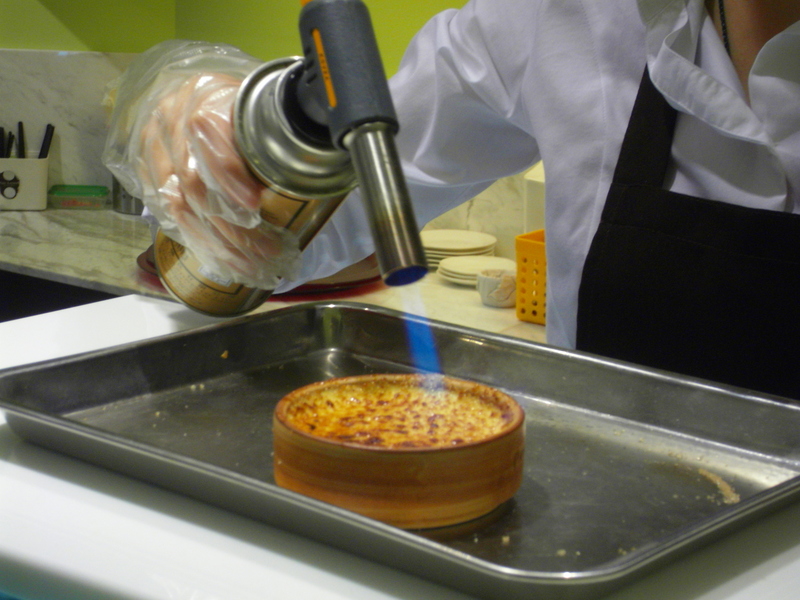 The creme brulee is reputed to the best in Hong Kong. 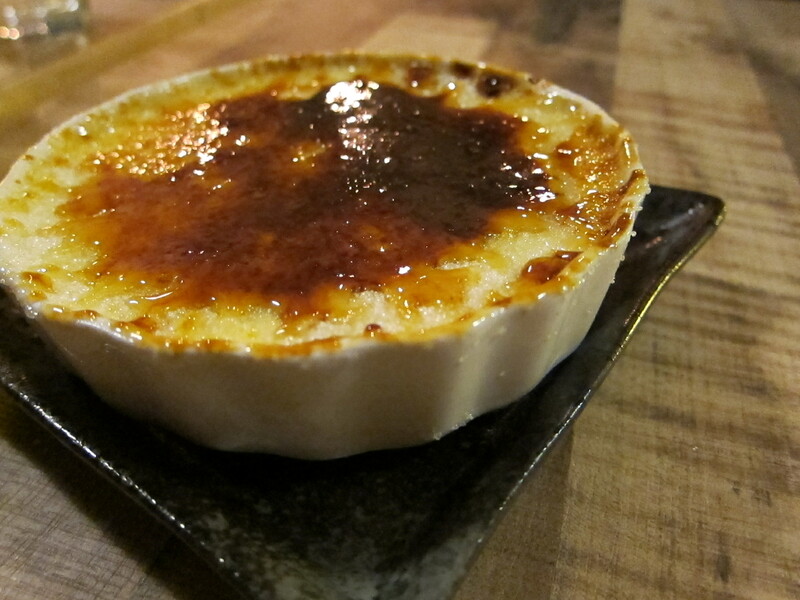 I can’t say that I’ve had every creme brulee in Hong Kong to judge this but, it was certainly the best I’ve ever had. It is hand-caramelised on site, (you can watch the shop girl wield the blow torch), and you can even take the bowl it comes in, home. 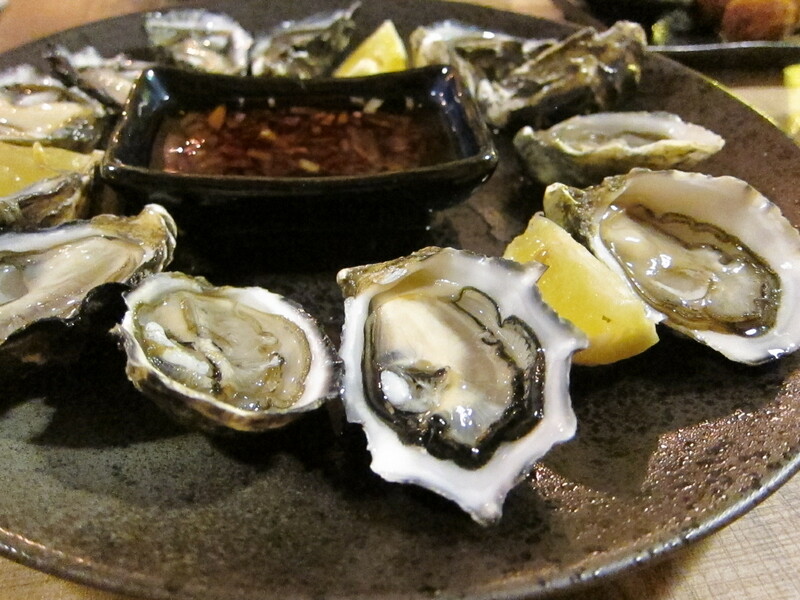 The texture and the taste was unbelievable. Trust me when I say that every morsel must be savored, because before you know it, it’s all in your tummy and you’ll mourn for a few minutes. 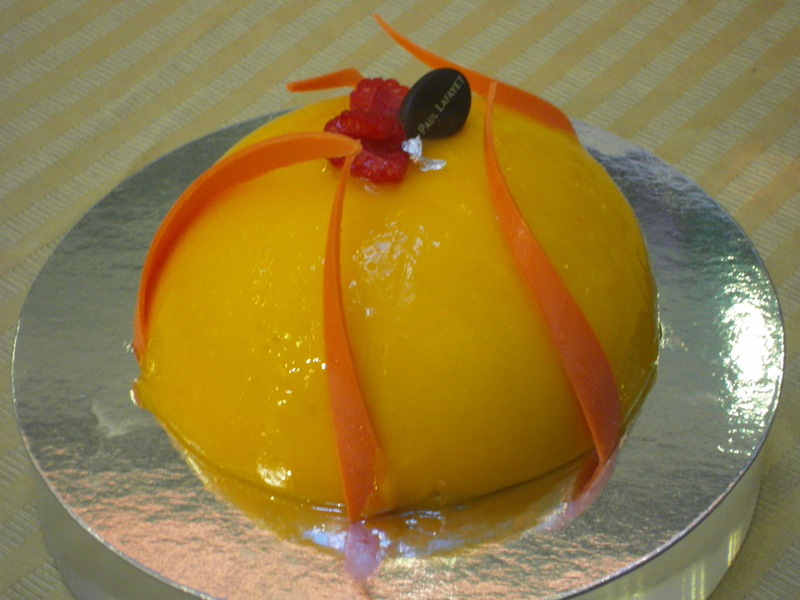 I adored the crunch of the crystallized sugar and the smoothness of the vanilla egg custard within glides off your tongue. 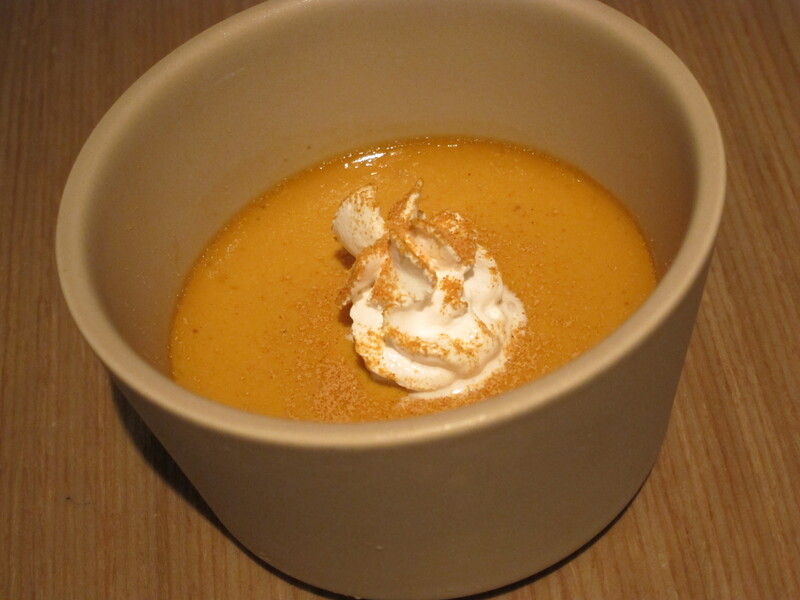 I love how you can actually see the vanilla pods in the custard. The next two cakes were both gorgeous. The Craquelin au chocolate, made from 70% single origin dark chocolate with a crisp base, will satisfy anyone’s chocolate craving and more. Very rich, the chocolate was intense and a little too much for me (but I’m not a chocolate fiend unlike some). 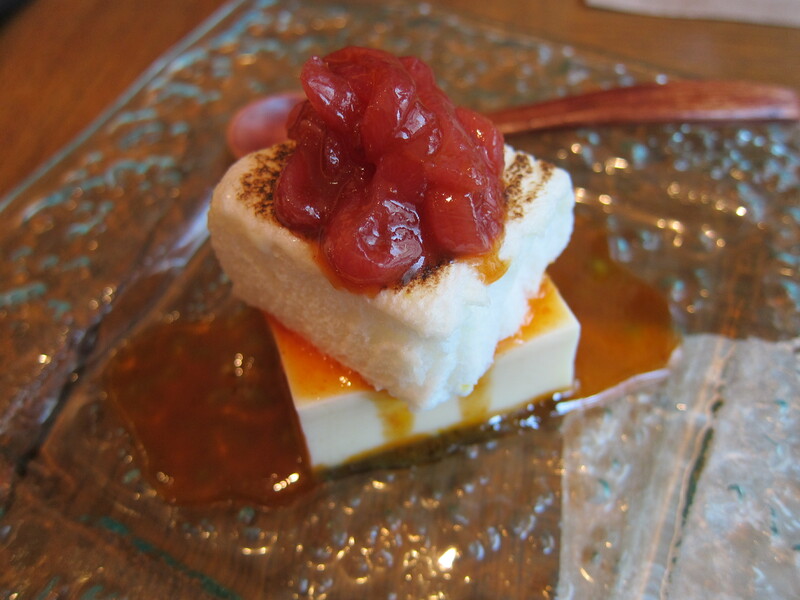 The Cremoso craquelin- a maccha mousseline with crispy praline chocolate, was divine and so delicate in flavour. The green tea penetrated through the mousseline with none of the bitterness you sometimes get in green tea puddings and I loved the praline finish. Ah macarons. 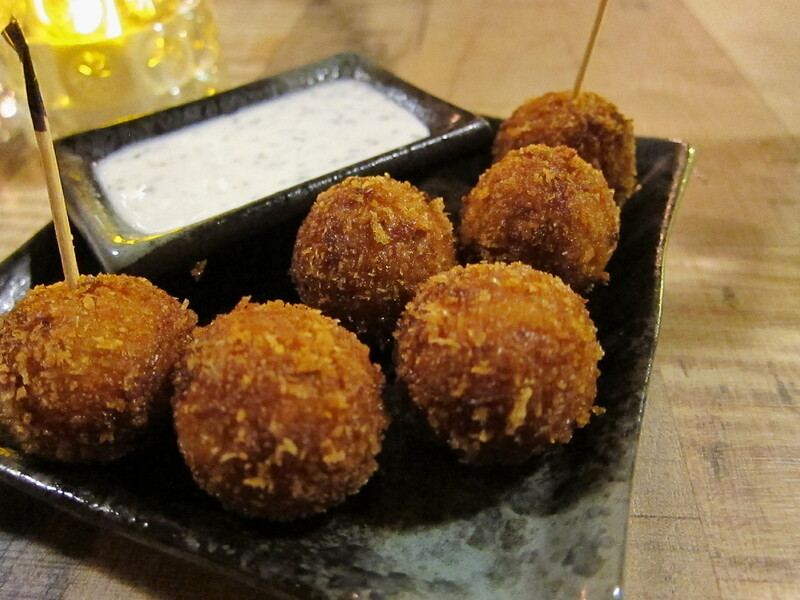 Little round parcels of food joy. 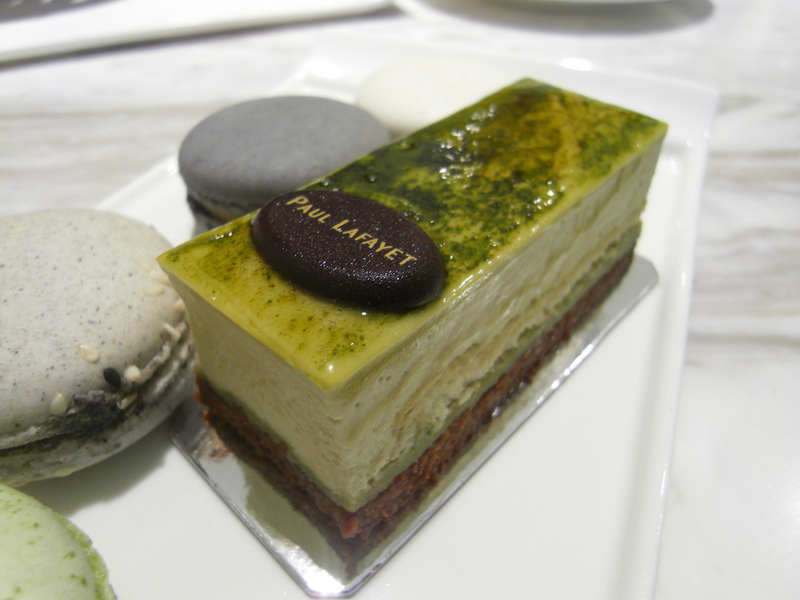 I selected four- jasmine, pistachio, oolong and sesame. 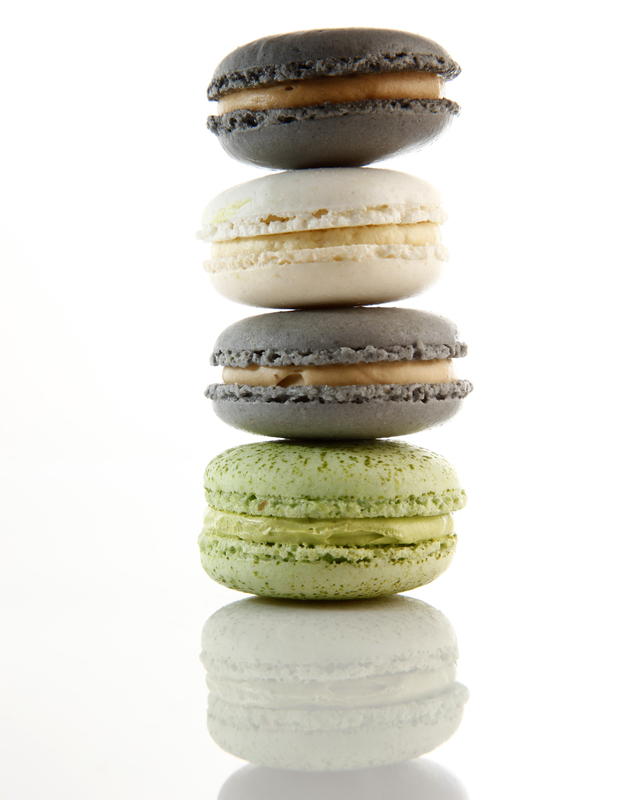 I started with the lightest in flavour, the jasmine macaron, which was subtly infused and fragrant. All four were ambrosial but my absolute favourite was the sesame. I smile thinking about it. If you’re thirsty, Paul Lafayet serves a selection of the fine Kusmi teas which were founded in 1867 in Saint-Petersburg, Russia and then taken to Paris by the company after the Revolution. I had the Prince Vladimir, a blend of Ceylon and China teas with scents of orange, lemon, vanilla, grapefruit and spices. 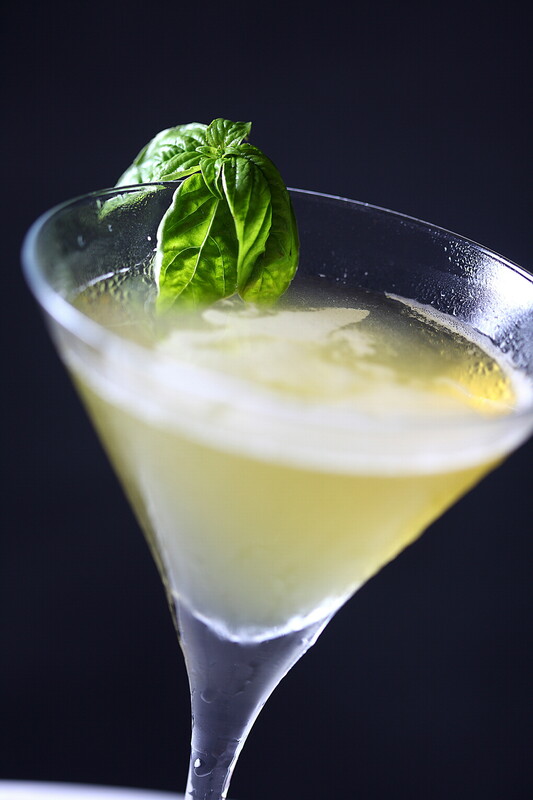 A refreshingly smooth and elegant accompaniment to dessert. 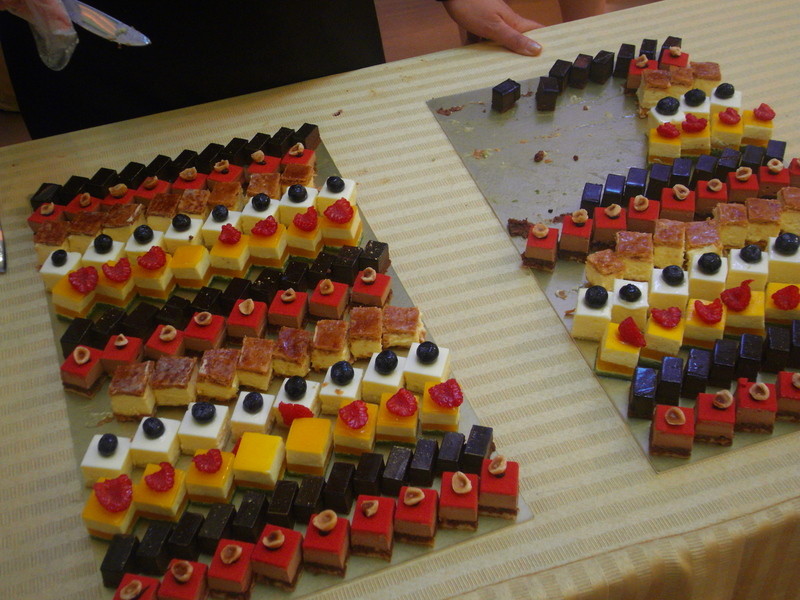 And after this tasting, a few weeks later I attended a Paul Lafayet grand tasting event. Check these gorgeous cakes out! 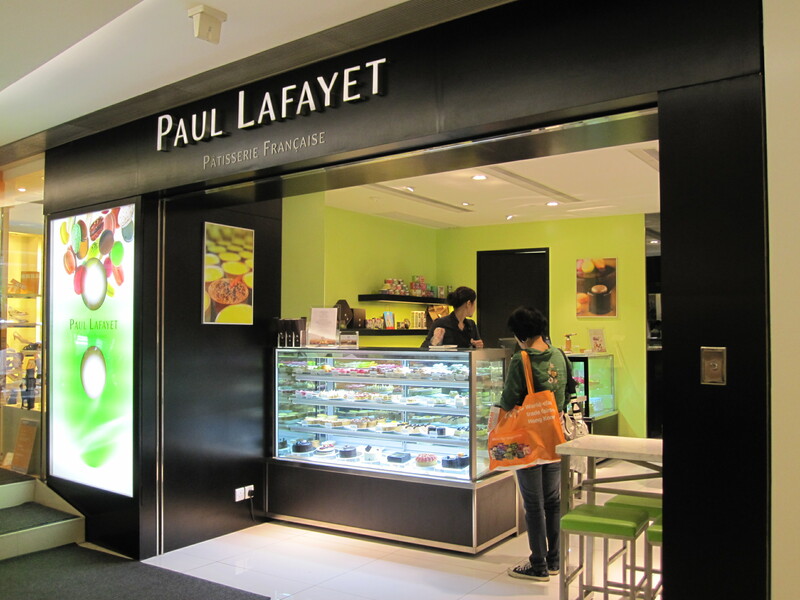 Paul Lafayet, Shop G13, G/F, Windsor House, 311 Gloucester Road, Causeway Bay/ G23, G/F, K11,18 Hanoi Road, Tsim Sha Tsui. 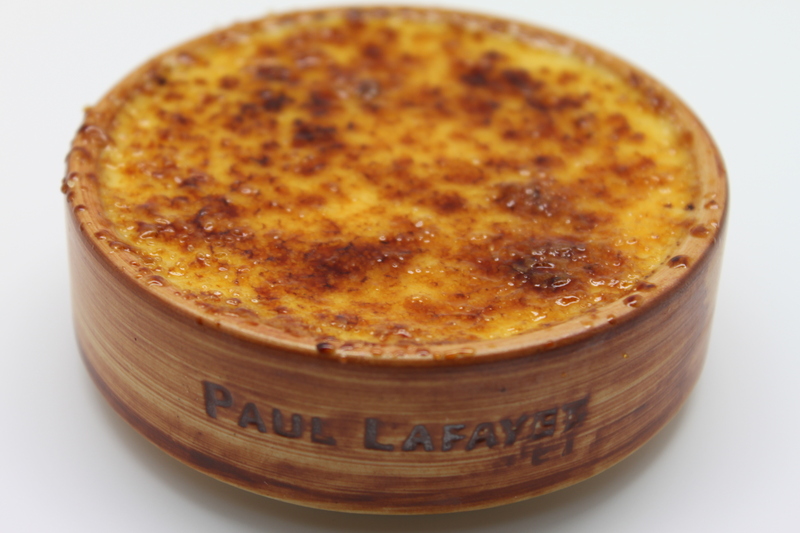 Categories: Dessert & Puddings, French | Tags: artisanal patisserie, Creme Brulee, Kusmi tea, Paul Lafayet, Toni Younes, Windsor House Causeway Bay | Permalink. 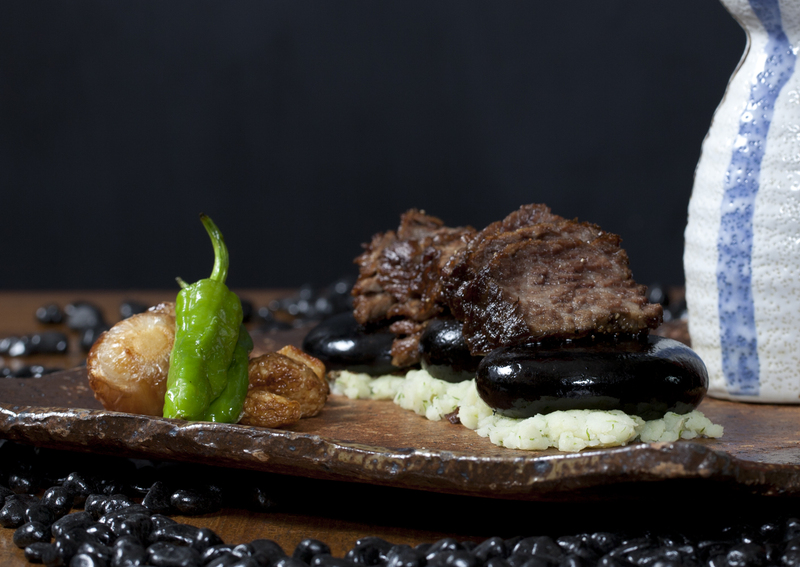 I think the situation has calmed down a fair bit since I wrote this for Sassy 🙂 If you love Kobe beef, this is something to check out. 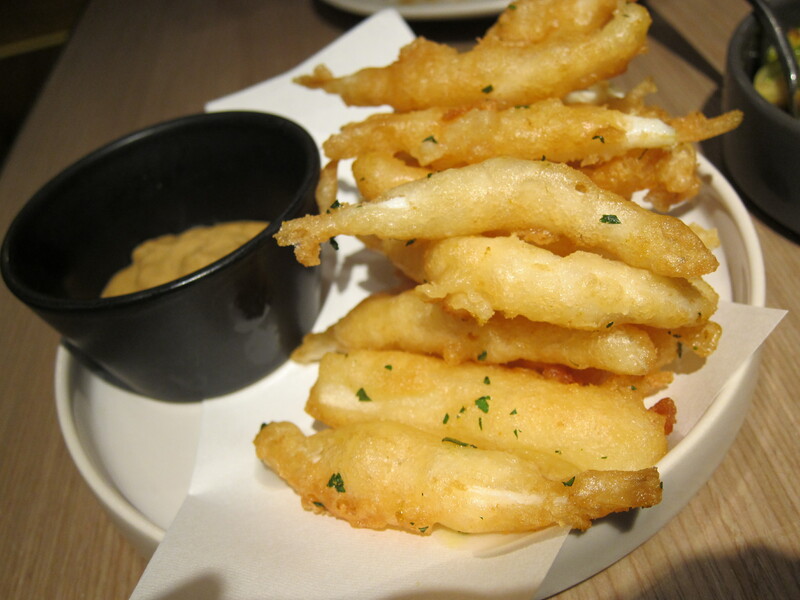 In the aftermath of the earthquake and tsunami in March, there has been a lot of concern and panic in Hong Kong and other neighbouring countries over eating Japanese food, especially sashimi and other specialty produce that is normally imported from Japan. 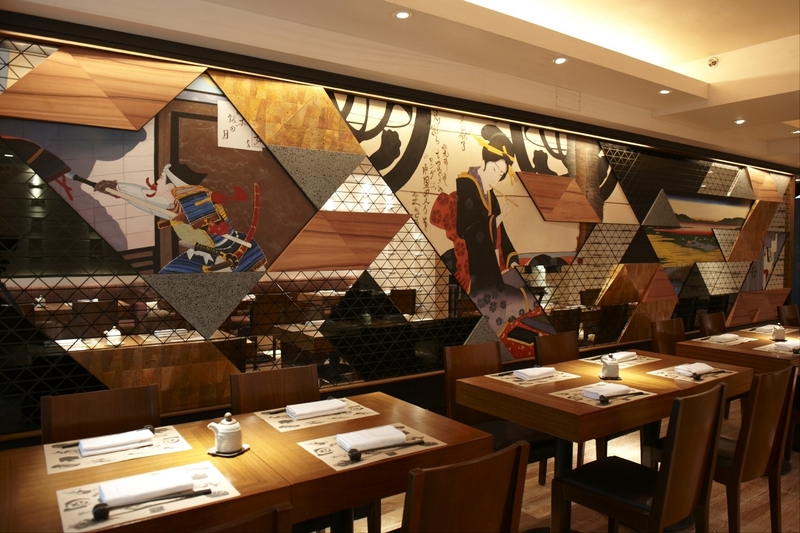 Instead of shying away and avoiding Japanese meals at all cost (which I know is the case for many), I feel it is important that we show our support and continue to visit Japanese establishments. 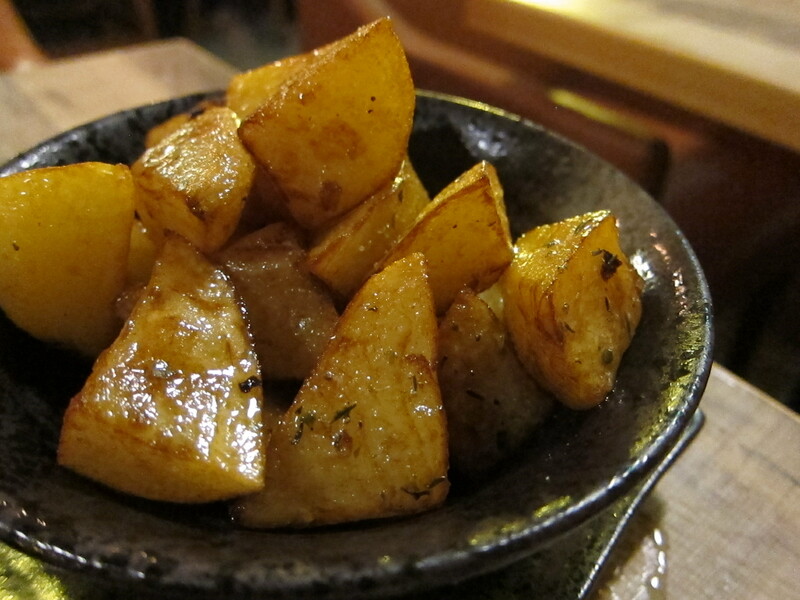 Many restaurants now obtain their produce from other countries, so we can all safely enjoy this wonderful cuisine. 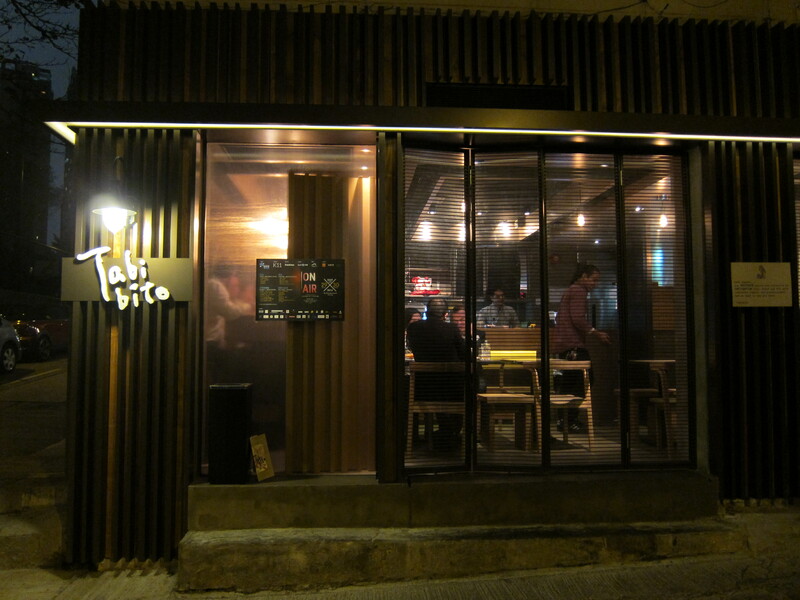 I had the chance to hop over to the newly relocated Kyoto Joe in Lan Kwai Fong recently, and it is one such eatery that has taken the pains to select its supplies from other countries. Their salmon is from Norway, their tuna from Indonesia and their beef from Australia. 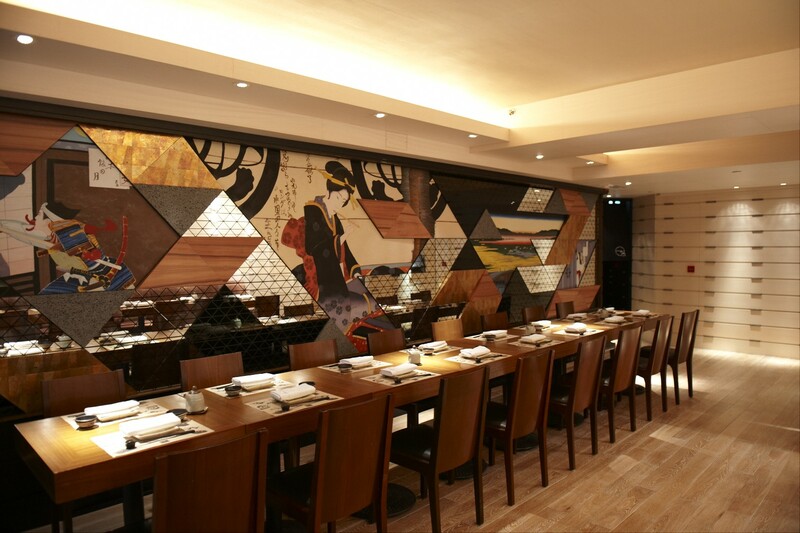 Relocating to 1 Lan Kwai Fong in January this year, Kyoto Joe has reinvented itself as a more sophisticated and finer dining establishment to its sister restaurant, Tokio Joe, round the corner on 16 Lan Kwai Fong. Sprawling over two floors, with a connecting internal staircase, its design is minimalistic and zen. 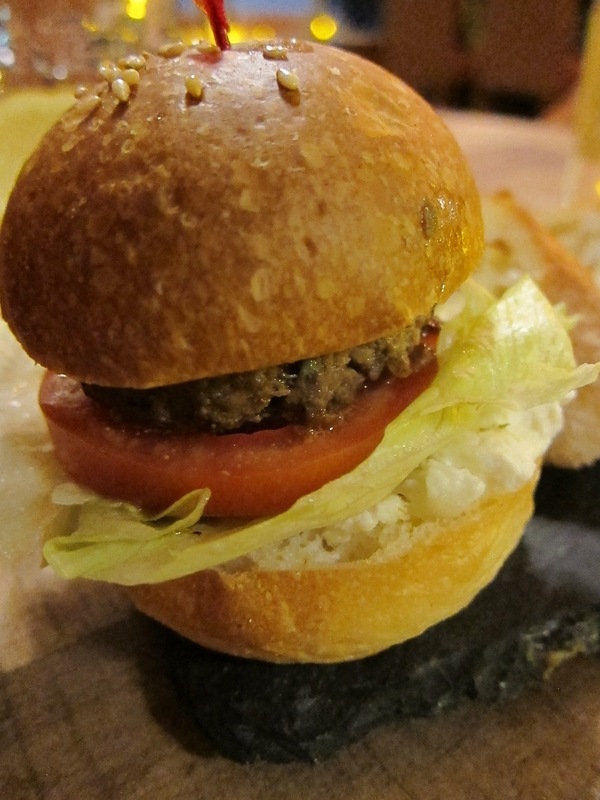 There are five zones, each with its own distinct features, and all creating an intimate atmosphere, such that you feel that you are in one of five smaller restaurants, rather than in one. The staff are friendly and attentive, my tea refilled regularly and with great care, (I tried once on my own without waiting and managed to spill it everywhere! I blame my ineptness on the design of the teapot). 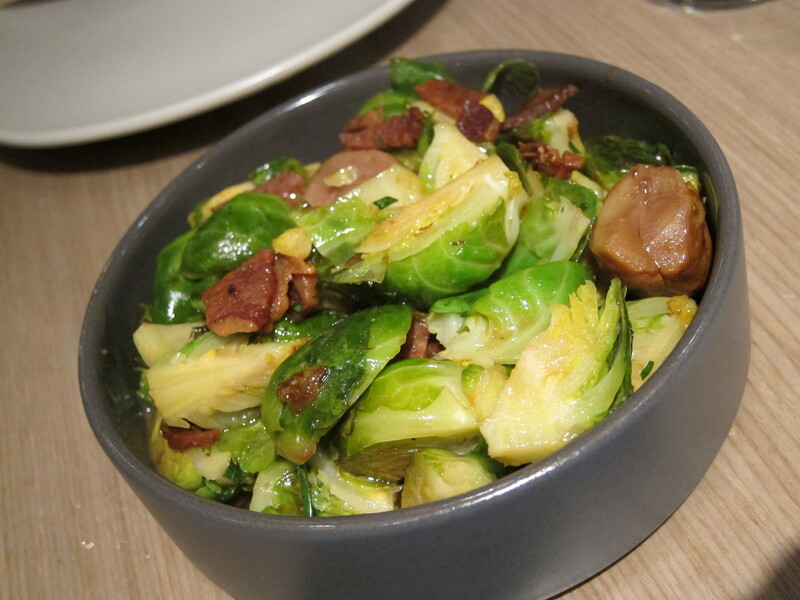 Their menu is new and improved with an injection of a fair number of new dishes. 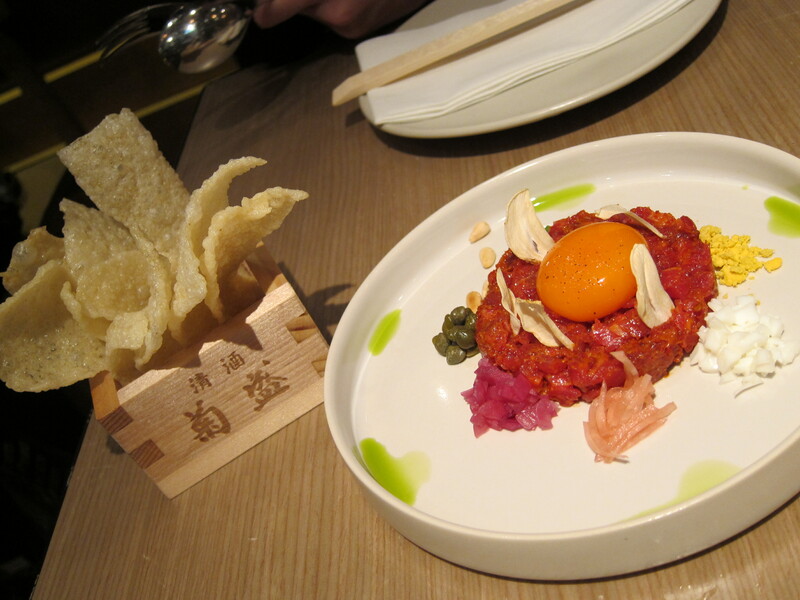 One notable change is the appearance of a set of Australian kobe beef dishes. I was told that Kyoto Joe’s speciality has shifted to more cooked food, in particular beef, and very soon I was sampling three different and amazingly melt-in-your-mouth kobe creations. 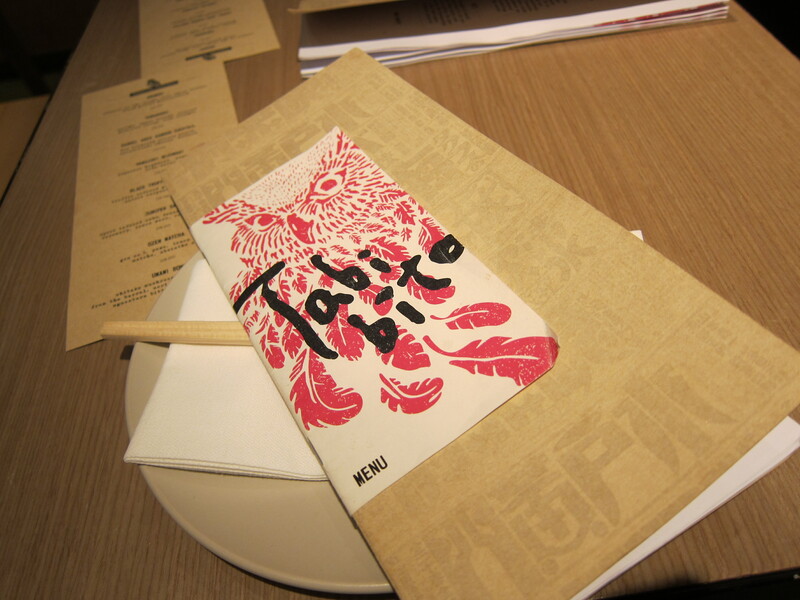 I sat in a booth by the sushi bar and had a good view of Lan Kwai Fong below. 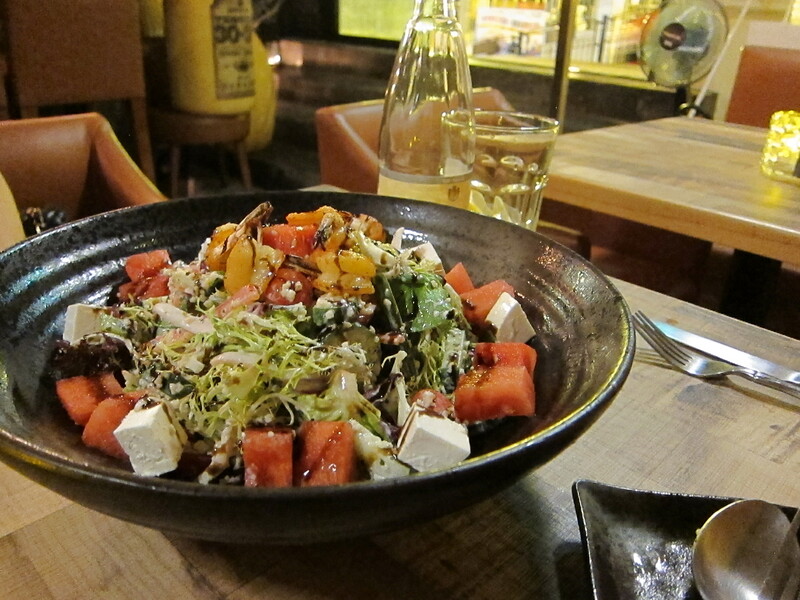 Before launching straight into the meat, I was served the delicious Kyoto salad to start, with fresh scallops, tuna and salmon on mixed salad with a drizzle of their house sesame dressing. I loved how the salad was topped with crunchy crisp pieces of deep fried wonton skin to create a punchy contrasting texture to the smoothness of the seafood. 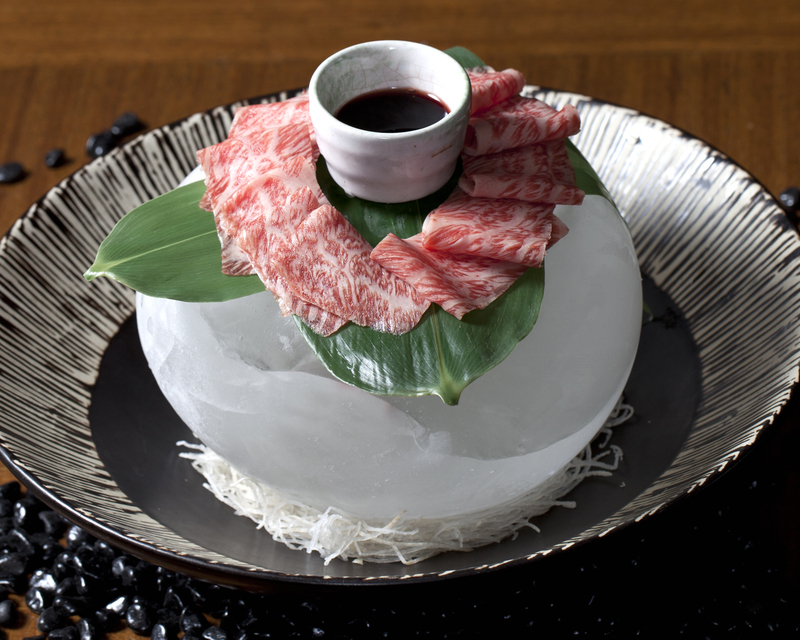 Next, I had the Gyu sashimi, impressively presented on a block of ice. This is Prime beef deltoid sashimi with red wine balsamic vinegar sauce. The beautiful marbled meat was impossibly smooth and melted in my mouth. It did have a very rich flavor but the vinegar sauce paired with it, helped to dampen the fattiness slightly. The Gyu maki was wonderful- more of the marbled beef rolled with asparagus and golden mushrooms accompanied by a lovely seaweed sauce. This is a clever creation as it is cold on outside as you take the first bite, which then diffuses to the warm centre and the crunchiness from the vegetables- extremely satisfying to munch on. As a palate cleanser, I had the Dobin mushi superior seafood broth quaintly served from a teapot into the world’s smallest teacup. I was probably meant to sip delicately from my teacup, but as I adore soup and my teacup was miniscule, I ended up having what felt like a few hundred servings! Up next, was the Rock Shrimp Gyoza- dumplings filled with rock shrimp, porkloin and chives and then pan-fried and served with spicy balsamic vinegar. I liked the vinegar immensely, the tinge of spice complimenting the fairly heavily filled dumplings which were nicely pan fried and succulent on inside. My last dish was the Karubi roasted prime beef spare rib with home-made teriyaki sauce. The presentation was fantastic, with the slices of the spare rib lying on top of hot stones to keep them sizzling hot, which in turn were lying on a bed of mashed potato. After heaving the stones to the side, (they are pretty heavy! 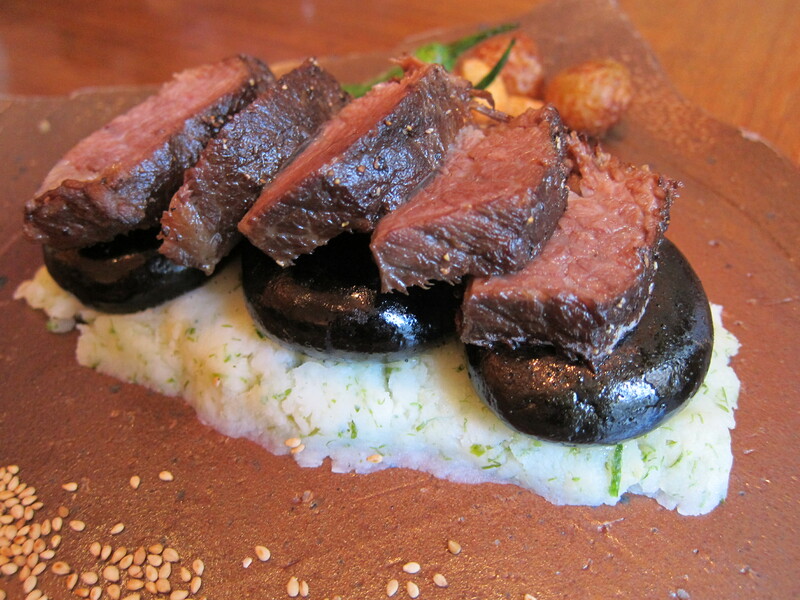 ), I was able to nosh on the gorgeous tender beef and the buttery mash. Definitely my favourite dish of the night. 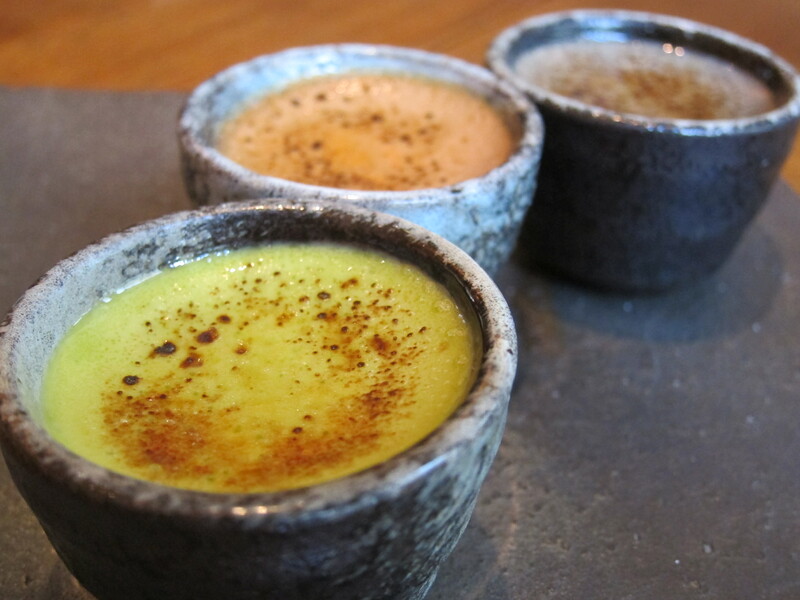 To end my evening of meat, I had the trio of crème brulee- three small pots of green tea, coffee and sesame flavoured versions of this popular pudding. I loved the green tea which was moreish and gently infused with green tea. 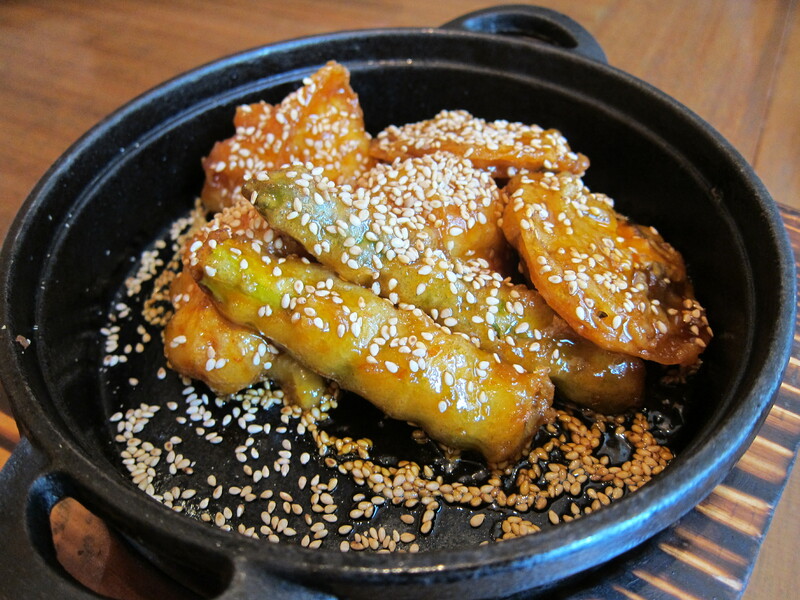 The sesame was heavier and more like a mousse with a very strong sesame flavour, in stark contrast to the green tea. 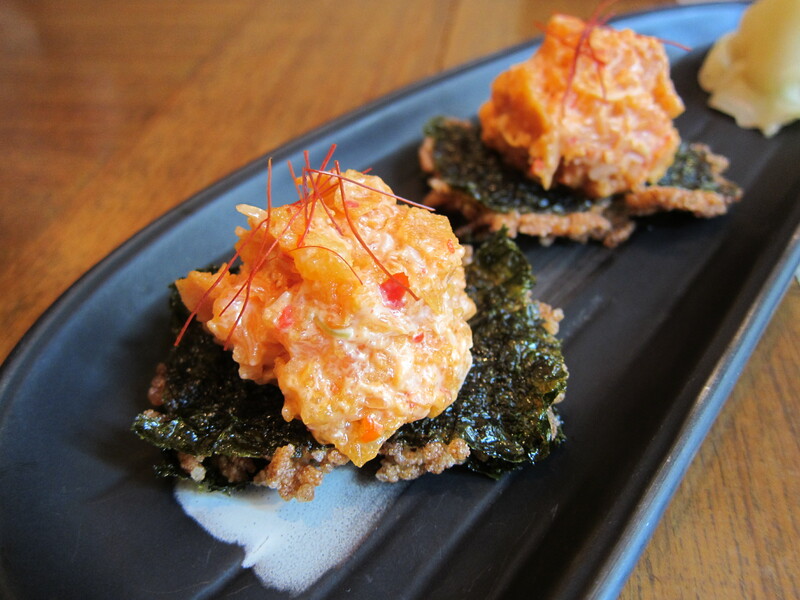 I hope that my review will encourage those of you who have been fearful of going back to Japanese restaurants, to think again and help in supporting them, and in so doing, carry on supporting the Japanese while they and their culture recover. 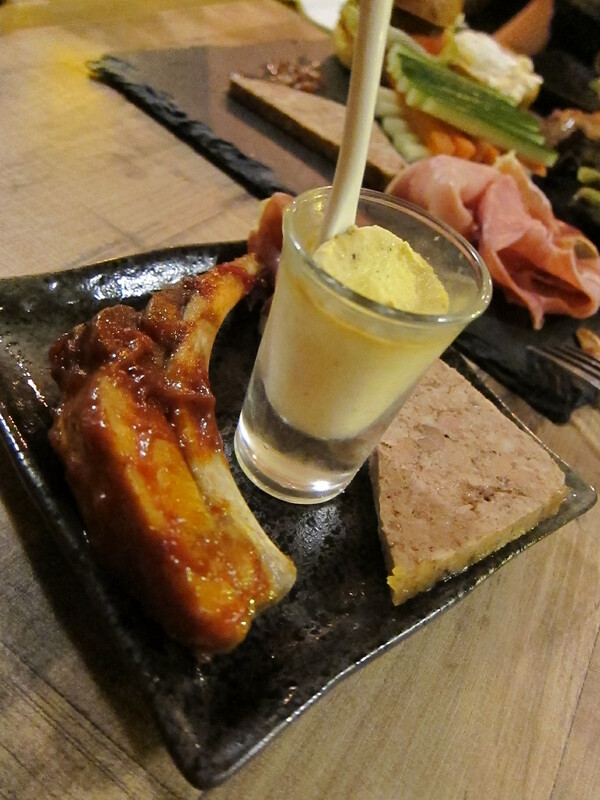 Categories: Japanese | Tags: Central Hong Kong, Creme Brulee, deltoid beef, gyoza, Kobe beef, Kyoto Joe, Lan Kwai Fong, Tokio Joe | Permalink.